Over the last few decades cell phones have gone from a rare curiosity to the dominant mode of electronic communications. They have also expanded well beyond a telephone and have become powerful hand-held computers known as smartphones. In fact, they have become a dominant force in daily life, occupying large amounts of time and attention. We have become seriously attached. They have become so dominant that, for many, the thought of being without it produces anxiety. Many people have become addicted. It is estimated that about 12% of the population is truly “addicted,” developing greater levels of “tolerance” and experiencing “withdrawal” and distress when deprived of them. Recent surveys and studies paint a vivid picture of our cell phone addiction: we feel a surge of panic when we are separated from our beloved cell phones. This has been given a name, nomophobia, “which is defined as the fear of being out of cellular phone contact, or “feelings of discomfort or anxiety experienced by individuals when they are unable to use their mobile phones or utilize the affordances these devices provide”. This phenomenon is so new that there is little understanding of its nature and causes. Obviously, nomophobia is ripe for scientific study. They noted that there were significant gender differences with women having significantly higher levels of anxious attachment and nomophobia than men. This suggests that women are emotionally more dependent and crave for more closeness and attention in their relationships than do men. and that women tend to become more dependent on their cell phones. So, just as women become more attached in their relationships, they also become more attached to their phones. Ibrahim and colleagues also found that, overall, higher levels of both anxious and avoidant attachment were associated with higher levels of nomophobia and lower levels of mindfulness and higher levels of mindfulness were associated with lower levels of nomophobia. These results suggest that the attachment styles of cell phone users and their mindfulness are associated with the level of nomophobia, with anxious and avoidant attachment promoting nomophobia and mindfulness reducing it. These results further suggest that people with more maladaptive styles of attachment, who are emotionally more dependent and crave more closeness and attention in their relationships, are also more prone to developing a phobia regarding their cell phones. On the other hand, people with high levels of mindfulness are less prone. So, mindfulness may, in part, be an antidote to nomophobia. 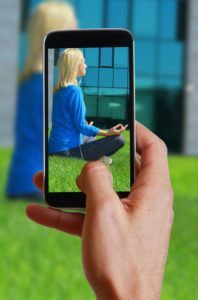 So, reduce cell phone withdrawal anxiety with mindfulness. There is a growing interest in nomophobia, which is defined as the fear of being out of cellular phone contact, or “feelings of discomfort or anxiety experienced by individuals when they are unable to use their mobile phones or utilize the affordances these devices provide”. However, only limited research can be found in terms of its determinants at present. Contemporary literature suggests that the relationships among attachment styles, mindfulness, and nomophobia have not been investigated. This study aims to investigate the mediating effect of mindfulness on the relationship between attachment and nomophobia. In addition, the study also focuses on gender differences in attachment, mindfulness, and nomophobia. A theory-based structural model was tested to understand the essentials of the associations between the constructs. The Experiences in Close Relationships Scale, Nomophobia Questionnaire, and Mindful Attention Awareness Scale were used to collect data from undergraduate students (N=450; 70.9% women [319/450]; mean age=21.94 years [SD 3.61]). Two measurement models (ie, attachment and mindfulness) and a structural model were specified, estimated, and evaluated. The structural equation model shows that the positive direct effects of avoidant (.13, P=.03) and anxious attachment (.48, P<.001) on nomophobia were significant. The negative direct effects of avoidant (−.18, P=.01) and anxious attachment (−.33, P<.001) on mindfulness were also significant. Moreover, mindfulness has a significant negative effect on nomophobia for women only (−.13, P=.03). Finally, the Sobel test showed that the indirect effects of avoidant and anxious attachment on nomophobia via mindfulness were significant (P<.001). The direct and indirect effects of anxious attachment, avoidant attachment, and mindfulness altogether accounted for 33% of the total variance in nomophobia. Gender comparison results show that there is a significant difference in attachment based on gender (F2,447=6.97, P=.01, Wilk λ=.97, partial η2=.03). Women (mean 68.46 [SD 16.96]) scored significantly higher than men (mean 63.59 [SD 15.97]) in anxious attachment (F1=7.93, P=.01, partial η2=.02). Gender differences in mindfulness were not significant (F4,448=3.45, P=.69). On the other hand, results do show significant gender differences in nomophobia (F4,445=2.71, P=.03, Wilk λ=.98, partial η2=.02) where women scored significantly higher than men. In general, individuals who are emotionally more dependent and crave more closeness and attention in the relationship tend to display higher levels of fear or discomfort when they have no access to their mobile phones. However, gender has a differential impact on the relationship between avoidant attachment and nomophobia. This study establishes the impact of mindfulness on nomophobia for women; therefore, future studies should test the effectiveness of mindfulness-based therapy approaches and confirm whether they are effective and efficient. On the basis of significant gender difference in nomophobia and attachment, we conclude that gender should be taken into account in mindfulness-based treatments dealing with nomophobia. Mindfulness training has been shown to have a myriad of positive benefits for the physical and psychological health of the individual. It has also been shown to be beneficial for those suffering from a wide range of physical and mental diseases. Research is revealing the mechanisms by which increasing this simple state can alter the individual so profoundly. For example, stress, particularly chronic stress, is known to have deleterious effects on physical and mental health and mindfulness has been shown to reduce the physical and psychological effects of stress on the individual. By reducing stress effects, mindfulness can have wide ranging positive effects on the individual’s well-being. Attachment has been shown to affect the individual’s well-being. There are a variety of ways that individuals attach to others. The particular strategies are thought to develop during childhood through attachments to caregivers. They are secure, insecure, avoidant, ambivalent, fearful, preoccupied, and disorganized attachment styles. Secure attachment style is healthy and leads to positive development while all of the others are maladaptive and unhealthy. These can lead to psychological difficulties and interfere with the individual’s ability to relate to others. Depression has also been long hypothesized to have roots in early childhood. Patterns of mother-child interactions are thought to produce different forms of attachment styles in the infant. All of attachment styles, save secure attachment style, have been found to be associated with depression. It is possible that one of the ways that mindfulness promotes well-being is by affecting attachment. In today’s Research News article “The Relationship Between Adult Attachment Orientation and Mindfulness: a Systematic Review and Meta-analysis.” (See summary below or view the full text of the study at: https://www.ncbi.nlm.nih.gov/pmc/articles/PMC5693974/), this relationship is examined. Stevenson and colleagues review, summarize, and perform a meta-analysis of the 31 published research studies on mindfulness and attachment style. They found that the published research studies report that mindfulness is significantly associated with lower levels of attachment anxiety and attachment avoidance. In other words, the higher the level of mindfulness in the individual the lower the levels of adult attachment anxiety and avoidance. This was true for each of the individual components of mindfulness; describing, acting with awareness, non-reactivity, and non-judging. Each of these four facets of mindfulness were found to be inversely related to both attachment anxiety and avoidance. Hence, mindfulness appeared to be counter to adult maladaptive attachment. It should be noted that these studies are correlational. So, causation cannot be concluded. That mindfulness and attachment style covary does not mean that one is the cause of the other. But, that the two are related suggests that there may be a causal connection. This may indicate another mechanism by which mindfulness improves mental health, by countering maladaptive attachment styles. 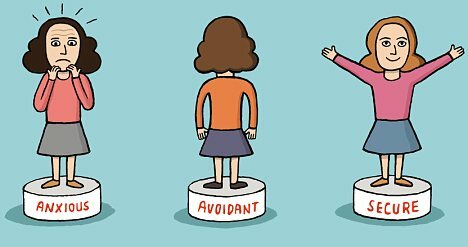 Anxious and avoidant attachment styles are both known to be associated with mental illness. So, mindfulness may promote mental health, at least in part, by decreasing these maladaptive styles. It remains for future research to investigate if mindfulness training can be a useful technique to promote healthy secure attachment and decrease maladaptive attachment and in turn promote mental health. So, improve attachment style with mindfulness. Mindfulness can be measured as an individual trait, which varies between individuals. In recent years, research has investigated the overlap between trait mindfulness and attachment. The aim of the present review and meta-analysis was to investigate the current evidence linking adult attachment dimensions to trait mindfulness dimensions, and to quantitatively synthesize these findings using meta-analyses. A systematic literature search was conducted using five scientific databases of which, upon review, 33 articles met inclusion criteria. Inclusion criteria were peer-reviewed journals and dissertations published in English that relied on quantitative methods using reliable and validated self-report measures where study participants were aged 16 years and older. Random-effects model meta-analytic procedures were used to investigate the relationship between both constructs. Cross-sectional studies found significant negative correlations between adult attachment insecurity, on either dimension (anxiety or avoidance) and both total mindfulness score and all five sub-dimensions of mindfulness (act with awareness, observe, describe, non-reacting, and non-judging), with the exception of a non-significant positive correlation between attachment anxiety and observe. The effect size of the relationships ranged from small to medium. The overall mean effect sizes were moderate (anxiety, r + = .34; avoidance, r + = −.28), with both attachment dimensions associated with lower levels of total mindfulness. Results are discussed in relation to theory and research. Implications for future research include the need to utilize longitudinal design to address causality and mechanisms of the relationship between these constructs.